Strap yourself in... or you might get shot as well. Soooooo many people die in Rogue One... not that you shouldn't expect it given where it sits in the Star Wars timeline - but from here on out - it's going to be Spoiler City in this Review. 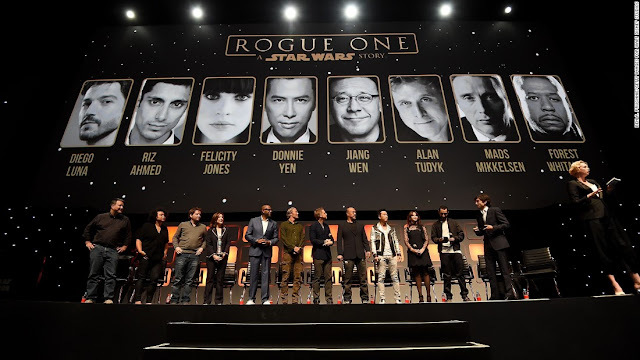 You do not want to be in this cast Q&A if you want to make an appearance in any future Star Wars movies... though given how Rogue One brought people back from the dead and from advanced age with CGI - you can't rule it out completely. So I went to see Rogue One last night and with a good 1 and a 1/2 hours sleep on my side - here's my review. Firstly - GO SEE THE MOVIE. That is if you like Star Wars remotely and like me - was reared on watching the original trilogy over and over again on VHS - mainly for the battle scenes. Because you get your fill and more in Rogue One. It's not a perfect film, it jumps all over the galaxy (yet thanks to movie magic hyperspace takes two seconds regardless of where the planet is relative to the other) - and probably lets itself down on a few fronts (more later) but as a whole - this is a very good Star Wars ride. I'll just jump in with thoughts as they come to me - it won't be entirely linear but hopefully it gets the job done. Darth Vader isn't in it nearly enough. The Dark Lord of the Sith gets very little airplay and though the payoff at the end of the film when he goes to Youngling Kill Level on the Rebel Fleet Troopers is sensational - we only get one other taste of the bad dude and that's a little forced interaction with Director Krenic. More on Krennic in a sec but Vader could have been integral in this... as they made Grand Moff Tarkin. Yep, Tarkin is there in all his CGI glory - to the point where you aren't sure what you are watching - an actor looking like Peter Cushing or just a reconstructed face on a faceless actor. The voice is nailed by the voice actor but the CGI just can't quite get Cushing's calm but stern veneer right - it's just my view but the CGI makes it hard for the director to get the right angle on him - so you are always thinking he's just a little back from the screen... just an observation but geesh - it's Peter Cushing for all intents and purposes so full credit for basically pulling it off. It should have been Vader vs Tarkin - the feeling out period before we saw Vader on Tarkin's leash in A New Hope - that said - Krennic is good. He's a little ocker (Australian for laid back - and yes the actor Ben Mendelsohn is an Aussie) for an Imperial officer but he's very good. He's a fun villain to watch battle the chain of command basically - and suffer at the end of the 'you are in fact dispensable' reality. The Vader/Krennic scene is nice to look at - as is the unveiling of Vader in a bacta tank surrounded by Imperial Royal Guards (on I'm guessing Mustafar) is cool but Krennic is too lippy for mine with Vader. Vader does his little force choke bit (which is the forced part for mine) but it's not a scene that has enough in it to suggest Krennic had to go to Vader direct. In short - Vader doesn't treat Krennic like his stool pigeon quite enough for Krennic to think he could get the Dark Lord on his side. Anyhoo - Vader is good, James Earl Jones is better as the voice and the only thing I wanted to see more of from Vader is him dispatching the Admiral Ackbar knock-off and his crew in the command bridge (extended cut please?). To Director Krennic - Mendelsohn is excellent - he's just nice and evil and wants to get stuff done. The opening scene isn't great (feels stretched out - that is when he captures Galen Erso and kills his wife) - but it does what it has to. Bit like Krennic all film. He's a factor in every scene - I especially loved him going toe to toe with Tarkin for control of the project - a sub-plot they got 100% right - Tarkin swooping in and taking all the credit just fits so well with an Imperial Governor. Krennic's Death Squad or whatever they are just look good and get some payoff during the film but it's not like Krennic isn't willing to do the dirty work himself. My main criticism is as above - he's a little rough around the edges for an Imperial as we've come to know them. That said - to build that weapon etc - maybe that's what was needed. If I'm writing it (which I clearly wouldn't be) I'd have built a little entourage for him - even if it was the engineers he kills off who worked with Galen. Just seems like a massive job for one guy to handle... That said - he does his job as a commander very well in the Scariff command tower. He's just fun to watch go about his business. Finally on Tarkin - just the right amount of him. I particularly like how he will use anyone to further his own goal/career - and when he targets Scariff he's taking pure joy in ending Krennic's existence and the Imperial collateral doesn't concern him at all - there's always more troops. What about the good guys you say? Jyn Erso is good. She's not great but she's not meant to be - she's the spoke in the Rebellion wheel and she gets to stand up and lead when she needs to. Perhaps the thing I like most about her character is she isn't running headlong into all of this - she is watching out for #1 the whole way (and then the rescue of her father) but it isn't until she's on top of the comm tower facing Krennic does she consider her own mortality. There was always a way out is how Felicity Jones seemed to play her - and I rate that highly. The band of merry men are all serviceable - Donnie Yen's character is the best of the humans (I had to google to find out his name beyond 'the blind guy' / Chirrut Îmwe) and coming in a close second is Jiang Weng's Baze Malbus (again thanks google). They work off each other really well and their dual death scenes are spot on. Oh yeah... I mentioned the deaths. 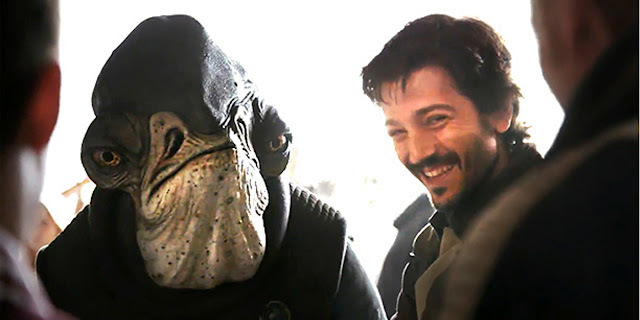 The Imperial Pilot character (Bodhi Rook - thanks again google) always seemed to have more to give - though that brain reading alien part was a total waste of a cool character idea - and gave it to us very late in the film. His death again - well done. The droid is there to deliver the laughs and does so but so much so that you don't expect anything but one liners... it isn't until K-2SO (I remember the K part) gets blasted away defending the databank section that you get another reason to like him... well apart from the stiff arm on Jyn in the scene on Obiwan planet... spell it out. Wobani - c'mon Disney - sometimes you can be too clever. Biggest credit I can give the droid is you don't consider it CGI for the most part - it moves way too well for a Star Wars droid that we saw in any of the Original Trilogy but it's well executed. The character is about the only one by the end of the film you could bring back for a future new trilogy film. Cassian Andor (all I heard when his name was said was Lando Calrissian - again try harder Disney!) is probably the best of the good guys in terms of depth of character. He's conflicted - and written deliberately so... which makes you wonder why if you go down that road of 'why do you fight reflection' - then why lazily call a planet after Obi-Wan Kenobi... - and his introduction of killing his informant to save time is seriously cold and unexpected. That said he does get in touch with his feelings when he doesn't shoot Galen but anyhoo... turns out he like Krennic can take a blaster at close range and live - so he's a heck of a spy! The fact he doesn't kiss Jyn at the end before they get obliterated is a nice show of restraint... by the same writers who named a planet after Obi-Wan! The dozens of Rebel Troopers who get fried... were fun to watch go out in a blaze of glory. Though the army pith helmets were too recognisable to 'reality' to not look like American liberators. Admiral Raddus (Ackbar's cousin) is good enough... though you are left thinking is that Ackbar before a hot bath because hearing character's actual names is always a challenge in this film. I like the fact he takes action and his flagship is a nice addition to the Mon Calamari Cruiser look. Though it doesn't appear to shoot much at all... I would have liked to have seen his death be played out in the first release but figure they have to have something in mind for the extended cut. The other Rebel officers are ho-hum - the General Draven guy is a waste of time and is there for one purpose - prove that even the good guys have bad guys on their side. The X-Wing general is semi-interesting then gets killed a little easily but a pathetic attempt to sell more toys with yet another new TIE design... Mon Mothma is good as she can be in what she's given, and it is good to see Bail Organa get some meaningful airtime this movie. There's a lot of nameless Imperial officers - which I like, just wish they'd CGI'd Admiral Motti and General Tagge from the Death Star meeting room (maybe they did?). Because when they inserted the Gold and Red Leader into the battle at the end (and I think there was a sneaky Biggs extra walk by?) - I was genuinely chuffed. They probably went to the well a few too many times with old footage recut but it was a nice touch - kudos. What else can I blab on about... clearly I've run around the place here. Ahhh yes... Saw Gerrera - average. Just not that interesting I'm afraid - the discount Darth Vader suit doesn't add anything and they never killed off his chief henchman which I thought was weird given we got plenty of closeups on him. The whole split from the Rebellion thing wasn't unpackaged like it could have been and that brain alien part was as I mentioned before - a total waste of a scene. Galen Erso - okay but lacks punch... maybe a scene where he discovers how the power the weapon with the Kyber crystal (again a waste of a concept because it's never really proven as integral - and is if you are a nerd like me - old school canon) and that's when he decides to put the failsafe in would have been good. His death is a little meh but the way he's used by Krennic on that platform in the rain was good movie fodder - of course Krennic was going to kill the engineers mate! Any scene in space or with an X-Wing. They are just the best. Scariff on ground fighting is superb - the AT-ATs are great to watch in action. Really like the look of Gerrera's temple base - we're back in Jabba's palace and I loved it. The street fight on Jedha was excellent - again they nailed the fighting element in this one. And of course - Vader going to town in the corridors on the Rebel flagship as he tried to get the plans back. That was worth the price of admission alone. What did you make of the film and or any of my copious amounts of randomised notes? As for a rating out of 5?